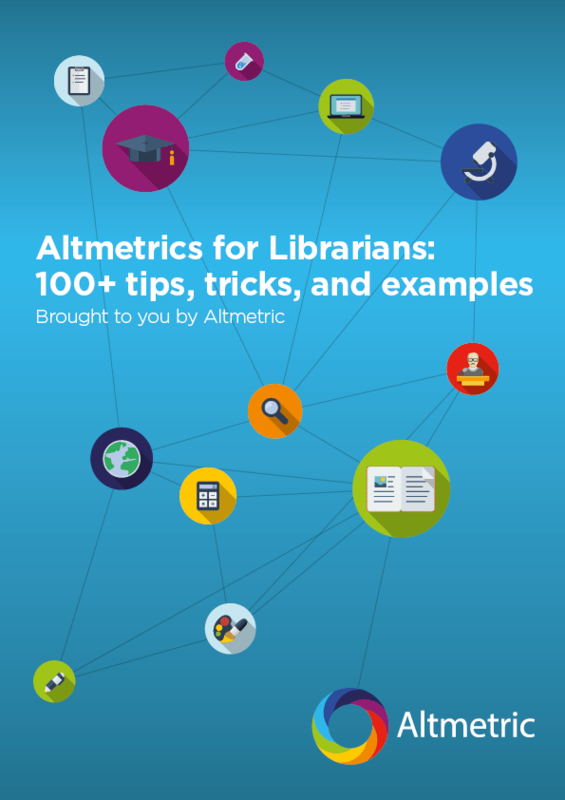 Many of you will be familiar with the Altmetric donut, often to be found nestling on article details pages across many publisher platforms both large and small. The data provided there gives authors and readers some great insight into who is talking about the article, and can be useful to them in identifying new content to read or new communities to engage with. But how are the publishers themselves using Altmetric data, and what value do they get from it? The (kind of) short answer is: in lots of different ways we would have never even thought of. Many of our publisher partners have reported back to us that they are not only using the Altmetric data to keep an eye on the levels and types of attention their articles are getting, but also applying this extensively across both their internal and external activities. In this post we’ll take a look at some of the use cases we’ve come across so far, but do let us know by email or in the comments below if you have anything to add. The obstacles publishers face today are in many ways very similar to those they have always faced: competing for library budgets, adding value for users, producing the best content, and understanding their audience and markets. New Open Access mandates and guidelines have meant that many publishers have had to adapt their traditional models and work to attract new authors, whilst at the same time ensuring usage remains high on content published under the subscription model. This new era of research dissemination and a focus on public engagement offers an opportunity: for publishers to align their goals more closely with the institutions and academics they serve, and to proactively demonstrate this. An increasingly growing list of metrics provide publishers and their customers with more insight into the content they publish and how it is being used than ever before. The bigger challenge, for many, is determining which of that data is of most use, and applying it effectively. Download counts, impact factors and citation stats will get you so far, but actually tell you little about why someone is reading a paper, what they think of it, or even who they are. This is where Altmetric and our data can help. We surface not only the number of mentions of an article from a particular source, but also the content of that mention, who made it, and what they were saying about the research. With the Altmetric Badges embedded in article pages all users can click through to see the original mentions of each paper. Even better, with the Altmetric Explorer, you can explore the entire Altmetric database and view all of the articles from a particular journal or set of journals in one go – allowing you to easily benchmark between articles and report on performance on a month by month basis – great for when you need to show the amount of reach and attention content published in a journal has received to society publishing partners (and how your journal is doing compared with competing titles). 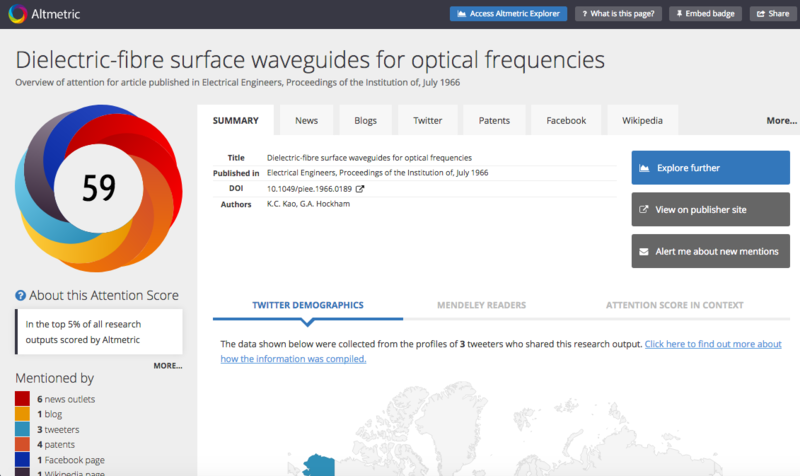 With the Altmetric Explorer, you can easily search and report on not only articles in your own journals, but also those of similar titles from other publishers. By filtering the data you can identify authors publishing in other journals who are getting a lot of attention – and because we show you not just how many people are talking about an article but also what they’re saying, you can ensure that it’s attention for the right reasons. Using altmetrics data to understand which of your own content is popular an be really useful. We spoke last year to MIT Press, who had done exactly this. They looked at the Altmetric mentions for all of their articles to help narrow down which content it might be good to include in their new ebook series. Altmetric data was of course not the only factor involved, and a team of editors had the final say, but it gave them a good starting point and enabled them to easily see which content might have a broader appeal. As more and more publishers switch to an Open Access author pays model, attracting and building relationships with authors is more crucial than ever. When Wiley first launched Altmetric Badges on their articles they ran a survey to see what their authors and readers thought of the data provided. The result? Nearly 80% of those that took the survey agreed that article metrics enhanced the value of a journal article. More pertinently, nearly 50% said that they were more likely to submit to a journal that provided article level metrics, with over 75% reporting that they were using the information provided to discover and network with researchers who were interested in the same area of their work. Knowing which of your content is getting the most attention where can be invaluable when it comes to forming future editorial strategy – as can monitoring the online activity happening around articles in competitor journals. 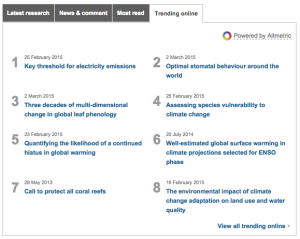 Altmetric data can be useful for determining hot topics for special issues, or help you identify where in the world you should consider ding additional author and reader outreach. Timing is crucial for promoting your content – once something is published you have a timespan of maybe a few months in which to really make the most of it. But other than editorial guidance, what can help you determine which content is worth promoting? Citations take too long to accrue, and downloads offer only one dimension of the full picture. 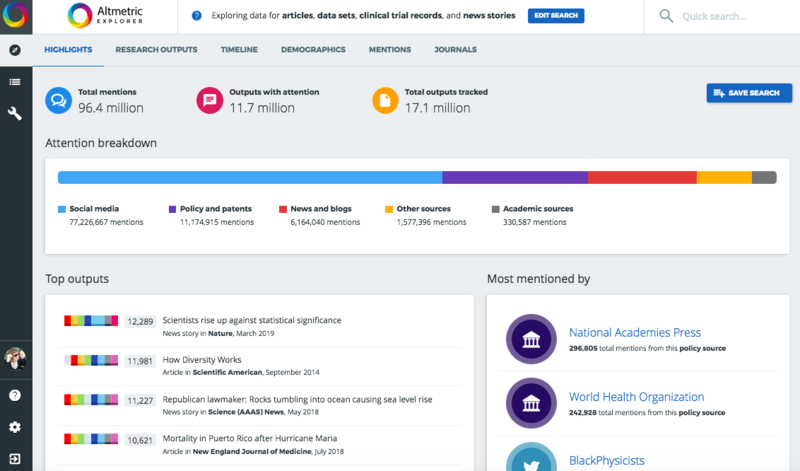 By monitoring the Altmetric data you can quickly and easily identify which articles are proving popular and turn it into a content discovery collection – ‘if you like this then you might like’. We’ve seen quite a few publishers so far using the Altmetric data as a way of generating top 10 lists of articles by journal or discipline that have been attracting a lot of online discussion and attention (see this example from Nature and this example from Elsevier) – a great way to showcase content that may not otherwise have been promoted. Monitoring the effects and ROI of your marketing activity is tricky at the best of times – and even more difficult is communicating the benefits of outreach work to your authors. Surfacing Altmetric data helps them and you to immediately see the results of your efforts; without needing to pull together lengthy reports. Collating all of the attention for an article in one place means you can easily see who is retweeting you, which press have picked up the article, and which bloggers are writing about it. Along with monitoring the success of existing campaigns, the Altmetric data can also help you identify gaps and new opportunities. Perhaps there’s a blogger or a particular news outlet that it would be beneficial to build relationships with – or even an entire user group that you weren’t aware of with an interest in the research. Take a look at similar articles from other publishers to see where they are getting most of their engagement, and work out how you can improve your existing plans. Helping your authors understand where their work is getting attention and who is engaging with it is a great way to encourage them to undertake more of this kind of activity themselves. Even if they don’t want to join in the conversation, it’s beneficial for them to at least be able to see who is talking about their work, and what’s being said. The data is also useful for demonstrating to institutional customers how much attention the research their faculty have published with you has attracted, and might even provide them with additional insight that they can in turn use for funding or to support career development. Publishers are already analysing turn-aways and paying close attention to who is downloading their content, but what about all the other people who are sharing and commenting on it? With Altmetric data you can get a better understanding of who is playing a key part in the online networks that surround your content – and this extra insight can help uncover new audiences who have an interest in the content but might not yet be a subscriber. Paying attention to how your content is being disseminated and shared online is an increasingly important part of any publisher strategy. It might become obvious that there is a key portal by which you should be making your content available, or it might even be a chance to become more closely involved with the institutional environment, and therefore better understand how you can work alongside your customers to help them achieve their ideal outcomes. If you’re interested in what’s been discussed in this blog post you might like to watch our short video to learn more about what Altmetric offers for publishers, or do get in touch if you’d like to talk us about any of our data or tools. who is talking about the article/information is prime, who is listening is the referential point of interest to publishers. i'm seeing both sides i hope as business. reciprocity, we both need each other and i think this edu. tutorial is one of the best i've seen to marriage publisher with student.